We’ve noticed that many of our readers are not only interested in crocks, but actually own beautiful crocks as well. Unfortunately, when an item becomes as popular and valuable as an antique crock, the reproduction market seems to kick in to full gear. So we’ve decided to show you some ways to avoid the fakes and identify an original, antique crock. Look for a maker’s mark – We know, this is an obvious tip that applies to so many antiques, but it’s especially important for crocks. These marks can be anything from a name, a symbol, a signature or even just a letter or a number. Some famous manufacturers to keep an eye out for include Red Wing, Thomas Commeraw and Watt Pottery. Study the crock’s design – Many antique crocks, like the one featured above, were often decorated with cobalt blue designs. Any decorations or designs should appear to be painted on, as opposed to printed or stamped on. The crock itself may have a shiny, glass-like surface that occasionally feels bumpy, which means the crock was salt-glazed. Try to identify the age – There are certain marks that can tip you off to your crock’s age. 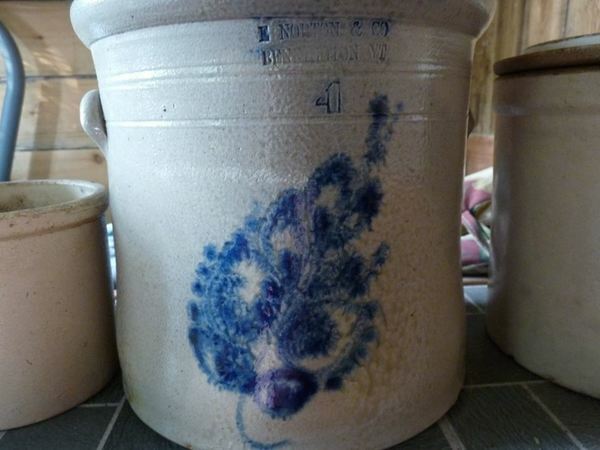 If the crock has a pattern, and the name of the pattern is on the bottom, that means it was made after 1810. If the mark includes the word “limited” (or “Ltd”), then it was mad after 1861. If the mark has a country of origin, it was made after 1891. Do you research – If you have a crock you’re unsure of, look it up online! Try to find the information on the maker, or if you can’t identify the maker by their mark, check out websites like eBay, Pinterest and Youtube. You can even perform a reverse Google Image search! The following video from Expert Village features a wide variety of valuable crocks. Take a look to get an idea of what a valuable crock looks like, and what characteristics you should look for. And if you own a crock, send us a photo; we’d love to see it!